Peter Case doesn’t receive anywhere near the respect he’s earned. Case, with fellow talents Jack Lee and Paul Collins, was an early punk pioneer with San Francisco-based band the Nerves, whose “Hanging On The Telephone” would later be recorded by Blondie. When the Nerves broke up, Case formed power-pop favorites the Plimsouls in ’79, the band’s song “A Million Miles Away” featured in the cult film Valley Girl and becoming a college radio staple throughout the ‘80s. By 1986, Case had launched his solo career with an engaging self-titled debut LP that earned the singer/songwriter a Grammy® nomination. In the three-decades-plus since, Case has created a solid body of work with his intelligent wordplay and unique blend of rock, folk, and blues music (i.e. what we call ‘Americana’ today...). 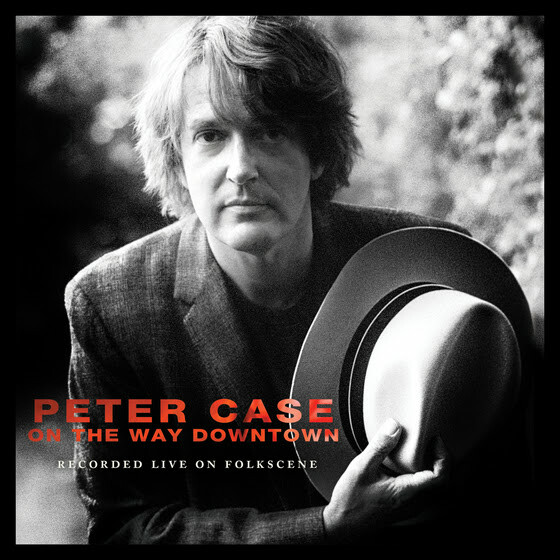 Case’s critically-acclaimed debut was reissued as a special 30th anniversary set with bonus tracks last year by Omnivore Recordings, who had also released his underrated Hwy 62 album in 2015. Now the label has dipped into the artist’s archives with a big net and landed On The Way Downtown, an entertaining eighteen-song collection featuring previously-unreleased performances from nearly 20 years ago. Documenting two live radio performances on the popular KPFK-FM syndicated radio program FolkScene, On The Way Downtown features a full-band performance of nine songs from Case’s 1998 album Full Service, No Waiting while the second half features material from the artist’s 2000 album Flying Saucer Blues as well as several songs from earlier releases. Both sets have remained unheard since their original radio broadcasts. Case was backed on his 1998 performance by a full band that included some mighty skilled folks like guitarist Greg Leisz (who has also played with Dave Alvin, Joni Mitchell, and Lucinda Williams, among others), bassist Tony Marsico (The Cruzados), and percussionist Don Heffington (Lone Justice, et al). So Case is in good company here, talent that shines through wonderful songs like the haunting “Spell of Wheels,” with its exotic percussion and blazing harmonica riffs, or “On the Way Downtown,” whose loping groove is accented by Case’s melodic vocals and an odd-but-affecting guitar line. “Crooked Mile” is fatback swamp-rocker with serpentine fretwork, rapid-fire vocals, and an undeniably menacing vibe while “See Through Eyes” is provided a more traditional folk-rock performance with emotional vocals and sparkling instrumentation that incorporates gorgeous pop melody. On the acoustic 2000 radio performance preserved by On The Way Downtown, Case is joined by violinist David Perales. The pair delivered a fine performance here that strips Case’s lyrics down to their naked emotional roots. “Something Happens” offers rich interplay between Case’s guitar and Perales’ violin that creates an exotic ambiance that allow Case’s vocals to ride on waves of ethereal sound. An energetic cover of Mississippi John Hurt’s spry “Pay Day” plays up the ‘country’ side of country-blues with nimble fretwork and twangy vocals while “Icewater,” from Case’s debut LP, combines the songwriter’s words with the music of Texas blues legend Lightnin’ Hopkins for a twang ‘n’ bang bluesy romp with locomotive harp and fast-peddling vocals dueling with Perales’ scorching violin licks. “Beyond the Blues” is a beautifully-crafted song, Case’s lilting vocals accompanied by a weeping violin that you’d swear was a pedal-steel guitar. “Paradise Etc” displays not only Case’s guitar skills, but also his wit as a wordsmith, the song featuring one of my favorite lines in “the apocalypse is over, and I still owe rent,” the lyrics sung above an elegant guitar strum. An inspired cover of the North Carolina Ramblers’ Charlie Poole’s “Leaving Home” is provided an up-tempo arrangement with fast-moving vocals and raucous guitarplay on an obscure 1926 folkabilly rave-up.